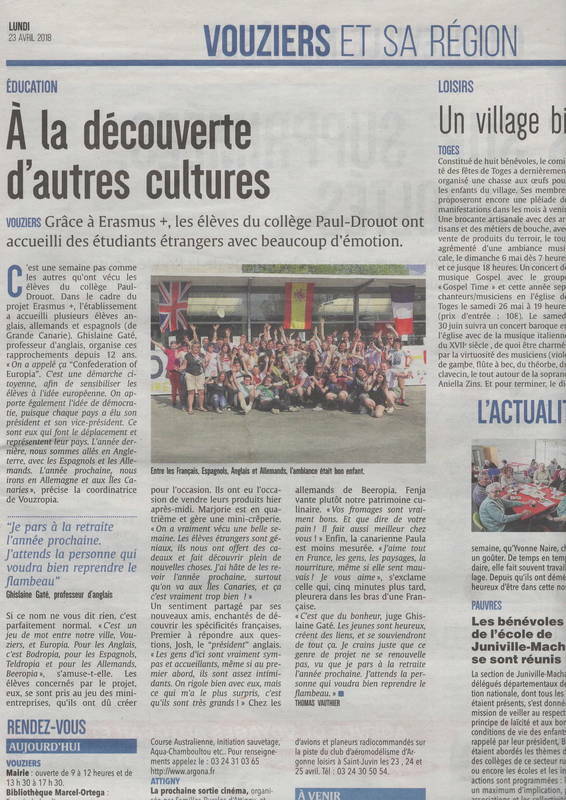 In April, 12 students from Bodmin participated in an Erasmus trip to Vouziers in France and stayed with French host families for the week. Some of us had already hosted our hosts in Bodmin last October, others were meeting for the first time – we were all VERY nervous. On the first Sunday, some of the students took a trip to the wildlife park and had a spectacular day looking around the site where they discovered a trampoline park in the woods. Some other students had a day out getting to know their host families. Throughout the week we travelled to the college, Paul Drouot, mainly by the school bus. At the college students enjoyed themselves whilst getting to know each of the nationalities and making new friends. It involved team building and group tasks with the the Spanish (Teldropia), German (Beeropia), French (Vouzropia) and the English students (Bodropia). The 4 nationalities make up our group Europia. On the Thursday all the students went into Paris by coach – we met at school at 5.30 am! The Presidents of Bodropia went to interview a French politician in the ‘Houses of Parliament’ (Assemblée nationale) whilst the others took a tour around the historic building. Afterwards some of us went to the Eiffel Tower, while the rest of us relaxed, having a picnic in the park – we then all went for a boat trip, lucky for us it was such a lovely day reaching the heat of 29-30 degrees! We walked back to the coach and stopped off on the way back to Vouziers to eat and sit together for a 3 course meal at the services. We got back to our host families around 10pm ready for our last day at the college. We then got in our groups to set up the businesses fair, all students from the school came out to purchase from the businesses. It involved things like: cookie making sets, smoothies, key-rings, slime, Erasmus t-shirts and more. That finished around 6pm when parents started to arrive for the presentation evening. This was very emotional, and afterwards we had a buffet and a party! We spent the Saturday with our host families exploring the area for a final time, it was great fun for everyone! Then on the Sunday we all met at the college to say our goodbyes and make our way to the train station which then took us to the airport. It was very emotional leaving our host families and the new friends we had made from the other countries. We took the plane back to Exeter where we got a rather large coach to the College where we greeted our parents. We all had an amazing experience and would recommend to everyone that you take every opportunity you get! Big thanks to the staff - the whole trip was such an amazing and enriching experience for them all, my daughter absolutely loved it. Fantastic organisation! My son had a fantastic time and has returned full of lovely stories and positivity. Such a wonderful opportunity for him and we're so grateful that he was offered the place. Thank you. Kids had a ball.... I'm jealous! Posts are written by students from throughout Europia. If you would like to contribute, use the Contact form on this website.